One of television’s busiest everyman actors for nearly fifty years, Robert Pine began his career as an early contract player for Universal’s sixties-era television factory. The same talent scouts who discovered him would go on, for better or worse, to give the world James Brolin, Susan Clark, Don Stroud, Ben Murphy, Susan Saint James, Lee Majors, Tisha Sterling, Cliff Potts, Christine Belford, and David Hartman. By that time, though, Pine had moved on to freelance success as a guest star, specializing in callow youths and finding favor in the seventies with, among others, producer Quinn Martin. Pine landed his first regular role on a short-lived QM series, Bert D’Angelo/Superstar, which turned into one of his worst professional experiences. Fortunately, a year later, he was cast against type in CHiPs, the show that would make him a semi-celebrity. 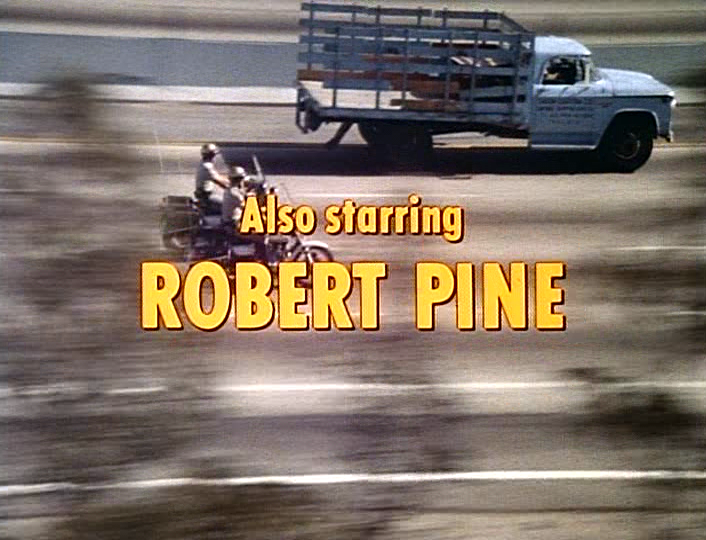 Pine played Sergeant Getraer, the fearsome, no-nonsense sergeant who often had young cops Ponch and Jon (Erik Estrada and Larry Wilcox) quaking in their shiny CHP boots. You’d expect to see a loud, scowling actor – someone like Jack Warden or TV’s original highway patrolman, Broderick Crawford – cast as Sgt. Getraer, but Pine, probably a more realistic choice in age and looks anyway, played it with a twinkle in his eye. Even as his son, Chris Pine, has achieved overnight stardom as the present Captain Kirk, the elder Pine continues to work prodigiously. Just in the last few years, he has appeared on Desperate Housewives, C.S.I., Parks and Recreation, The Office (as Jim’s father), The Event, The Mentalist, Castle, Leverage, and House, M.D. ; in another twenty years, he could be his generation’s Bill Erwin. Pine attributes his longevity in part to a willingness to accept small roles; I would add to that a chameleonesque quality that has kept him from ever getting typecast, and also an upbeat (and politically savvy) affability that extends to a reluctance to say anything bad about anyone he’s ever worked with. In a phone interview conducted in May, Pine steered artfully around the bad moments (and bad behavior) he observed on sets in order to share some memories about his early days in television – and, of course, about CHiPs. You were a contract player at Universal during the period when it was the last studio large enough to actually have a pool of actors under contract. The contract was my first job. I was so green at all this. I had been a pre-med in college, at Ohio Wesleyan, and graduated in ’63. Decided to be an actor in February of ’64, and ended up doing a scene in front of Eleanor Kilgallen, who was the representative for Universal in New York for new talent. She said, in April, would you like to go to California for a screen test? I said, well, I guess so. So I came out and did a screen test, they picked up the option, and my contract started on May 25, 1964. I drove out to California and really started my professional career under contract there. This was in November of 1963, and I said, “Well, I have to stay in school until February. I promised my dad I’d finish the semester. He’s paying for it.” Which I did, and then called Bob, and he sent me to every agent – William Morris, Ashley-Steiner, and I went with Ashley-Steiner. Your real name is actually Granville. 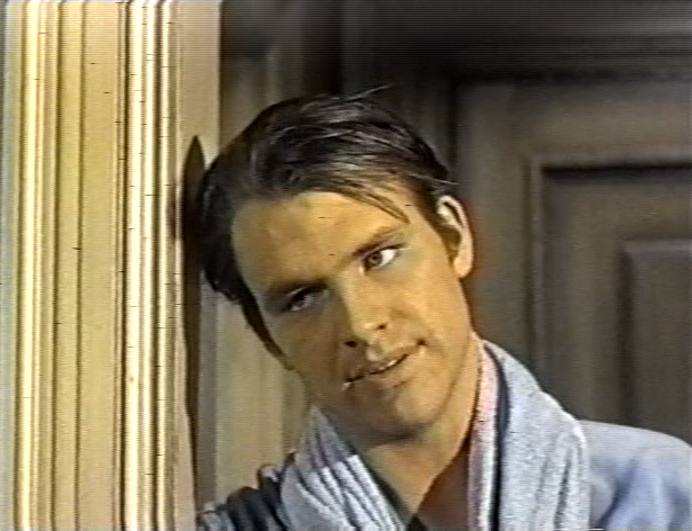 How did that become Robert Pine? Granville Whitelaw Pine, yes. I’d never cared for it. The first day of school, the teachers called the list of names, “Granville Pine,” and immediately heads shot up. I never liked Granville; it was too formal and I felt like an idiot. It was my dad’s name, but I never was close with my dad. Buzz was my nickname all through school, and my oldest and closest friends still call me that. Then when I went under contract – I guess I was twenty-two, and I looked about seventeen or eighteen – and Monique said, “Would you mind changing your name?” I said, “Fine with me.” “Why don’t you pick something,” and so I picked Robert. Not Bob, but Robert. It’s pure whitebread, but I like it. I liked something that wasn’t quite as oddball as Granville. What was the experience of being a contract player in 1964 like? At that particular time, they didn’t have classes or schools. You were just under contract. It wasn’t like the old days, and I know later on, after I was there, a guy named Vincent Chase had an acting class there. But I did get acting lessons with Jeff Corey, who was a wonderful teacher, who taught Jack Nicholson and other notable people. I took singing lessons. I took horseback riding lessons, because westerns were big, which was one of the better moves that I ever made. Then I would go out, because they didn’t place you – you still had to go out and audition with people on the lot. Then I started getting some work. And it worked for about three years for me, but I wasn’t – the way you add value to the studio is, if you were able to get into a series there, or they loaned you out to other studios who wanted your services, and made money on your contract. They were paying us very little, of course, and would loan you out for more. I just hadn’t done enough to be of any interest to anybody but Universal, so that lasted three years until ’67. Then I was out in the cool world. Did you have an advantage over freelance actors in terms of getting work at Universal? Yeah, I think I did. There was a woman there who was Eleanor Kilgallen’s sort of counterpart out here, Monique James. She acted like your agent on the lot. She would work very hard, show film to them if you managed to get any. In those days there weren’t tapes or discs; they would actually get a screening room and screen some film that I’d done in another show or something to interest whatever show you were being pitched to. Monique James’s name comes up in many, many actors’ tales of how they got started. She was a wonderful lady, a short little woman, but very formidable, and would take care of her “darlings,” as she would call some of us. Very Hollywood. She was the daughter of an editor of the New York Times. She was a terrific lady and I liked her a lot, as I did Eleanor. And Eleanor is still with us, at age 94, and I still keep in contact with her. With Jimmy Whitmore and Tommy Sands, who was a big singer back in the day. I remember getting the script and reading it and thinking, “Gosh, this is a terrible script.” Well, it turned out to be a wonderful show. It was just my inexperience at reading a teleplay. There were a lot of flashbacks, which I didn’t understand, reading it on the page. I’m not sure any of them count as classics, but the features you made during those three years are pretty diverse: an Audie Murphy western (Gunpoint), a spinoff of The Munsters, a beach party movie (Out of Sight), a war movie based on a Richard Matheson novel (The Young Warriors), and a Civil War movie (Journey to Shiloh) that also starred James Caan, Harrison Ford, Jan-Michael Vincent, and an uncredited John Rubinstein, whose big scene was with you. Gunpoint was my first feature. We went to St. George, Utah. Morgan Woodward was Drago, the head of our bad guy gang – I loved that name. I ended up doing a number of shows with Morgan, who was a wonderful guy. I did a Gunsmoke of his called “Lyle’s Kid,” in which he played my pa. I was at that age – for about ten years I had a lot of “pas.” I did another Gunsmoke with Jeff Corey, and I think he was my pa. Will Geer, he was my pa in a Bonanza. Did you get to know Audie Murphy at all? He was a hard guy to know, because he was very protected. From what I understand he slept with a gun under his pillow. Loved to do practical jokes. He had this long, five-foot pole with a string on it, with a fake spider on the end of it, and he’d go around and very quietly put it on somebody’s shoulder and scare the crap out of them. Not unpleasant in any way, but just sort of kept to himself. Joked around with the stunt guys a lot. Munster, Go Home was great fun. I went in on an interview for that, and Monique said, “Use an English accent. Go in there as if you’re English.” So I did, and they cast me, thinking I was in English. I loved that. Terry-Thomas was in that, and Hermione Gingold. Most of my stuff was with the young woman, Debbie Watson. Both of those were directed by Earl Bellamy. “No Sweat” Bellamy. When you’d blow a line, he’d say “No sweat. No sweat, let’s take it again.” Earl was a good guy. He was a very workmanlike director. He was telling me on the set that he really liked Rabbit, Run, by John Updike. He said he’d bought the rights, and I immediately ran out and read it, to see if there was anything in it for me [that is, a role that he could play]. I didn’t really understand it all that much; I don’t even know whether I finished it. But I didn’t think there was anything in it for me. And you did a Run For Your Life with Stuart Rosenberg, just before he made Cool Hand Luke. 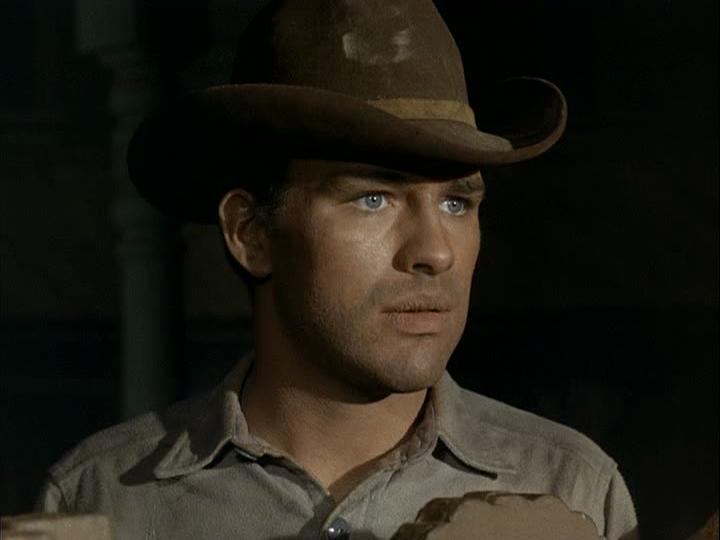 Robert Pine at Universal: Kraft Suspense Theatre (“A Lion Amongst Men,” 1964, with Peter Duryea and Michael Bregan); The Virginian (“Dangerous Road,” 1965); Run For Your Life (“The Cruel Fountain,” 1966). You were a guest star on The Lucy Show. She was great. I was about twenty-six, playing seventeen. Lucy took a real liking to me and said, “You know, I’m about to do a movie with Henry Fonda, Yours, Mine, and Ours. I want to take you over to the Paramount lot and see the director of that. I want him to see you to play my oldest son.” So she took me by the hand over there to meet Mel Shavelson. I was too old for it. The guy who ended up playing it was [Tim Matheson]. He was a little bit younger than I was, and was certainly a better fit. But she was very nice to me. I remember on the set, when Desi [Jr.] called up wanting something, and she was saying, “Desi, I want you to be home now. No, no, no. You’re not to go out. You’re home tonight.” I mean, being a real mother, laying the law down. I also worked with Sammy Davis, Jr., on a couple of shows. I did a Danny Thomas Hour, which was an anthology show, and of all things, a Charlie’s Angels, which we did at his [Davis’s] house. I remember going into his house and there was a couch there, about twelve feet long and then ten feet long in the other direction, all in Gucci leather with little G’s. Was there a particular role on television that elevated you from supporting parts to leads? Yeah, that Gunsmoke with Morgan Woodward. The part was first offered to Beau Bridges, but he had just got a movie. He decided he wasn’t doing television any more. So I got his part, and I got some good attention from that. During the seventies you became one of the rotating clean-cut young men that Quinn Martin favored to guest-star on his series. The great thing about Quinn Martin, he had a lot of shows on the air and once you’d done something for him, you never had to go in and read. Your agent’d call to say, “They have a part on so-and-so. It’s worth this much. Do you want to do it?” And, you could work every year, not like today, where in a series like House, if you’ve done one House you [can’t] work that show again for the eight years it’s on. Cannon, I’d do every year. You could do one every year. I did an NCIS the first year – they called and said, “Would you do us a favor? A guy dropped out, it’s a very small part.” I said sure, and because of that I’ve never been able to work that show again, and that’s been on a long time. Did you get to know Quinn Martin at all? No. I don’t think I ever even met him, and I did a series for him! That was Bert D’Angelo/Superstar, which ran for half a season in 1976. It was a spinoff of Streets of San Francisco, with Paul Sorvino and [Dennis Patrick] as the captain. We did it in San Francisco and I lived up there for six months. It was a tough shoot. What I’d rather you say with this is that the less said about that show the better, and leave it at that. How did you come to be cast on CHiPs? Rick Rosner, who created it, had seen a pilot I did called Incident on a Dark Street, which didn’t sell. David Canary and another actor who was new at the time and I would have been the regulars. It was in 1974, I believe, and it was about the attorney general’s office, and 1974 was the year that John Mitchell, the attorney general, was sent to jail or whatever because of Watergate. So they weren’t buying anything about the attorney general’s office. Too bad, because it was a good pilot. Anyway, he had me in to read for the part, and I told my agent, “This isn’t gonna go. There have been so many cop shows.” And I said that to Rosner when he cast me in it, and he said, “This gonna go. This is gonna go.” “Well, okay, man.” Of course, he was right and it went, much to my surprise, for six years. Had you played many parts like that before? No, not really. It was different, because I was only thirty-six when we did it, and very rarely would somebody at that age be [cast as] the head of something like that, or the boss. But, the Highway Patrol being what it is, there are indeed many sergeants who are thirty-six. So it worked out well. I was a little disappointed when we started, because I was hoping for something where I would be more the lead, or one of the central figures in it. Even though I was one of the central figures, I really wasn’t. There were two guys and then you’d go down a little bit and there was me, and then you’d go down some more and [there were] the other guys. But after a year or so, I was fully on board, appreciated it, and realized any job is hard to come by in this business. Your scenes with Ponch and Jon were often played for comedy. You had a really nice slow burn whenever they tried to explain how they wrecked their bikes or got into some other kind of trouble. I think it was a nice blend. I did get to have a sense of humor in it, and even though it wasn’t a comedy, there were comic parts in it. You didn’t want somebody who was too hard in it. I did tell Rosner, I said, “If you could do me just one thing. I understand my position in this show, but when I’m in a scene, I’m in it. 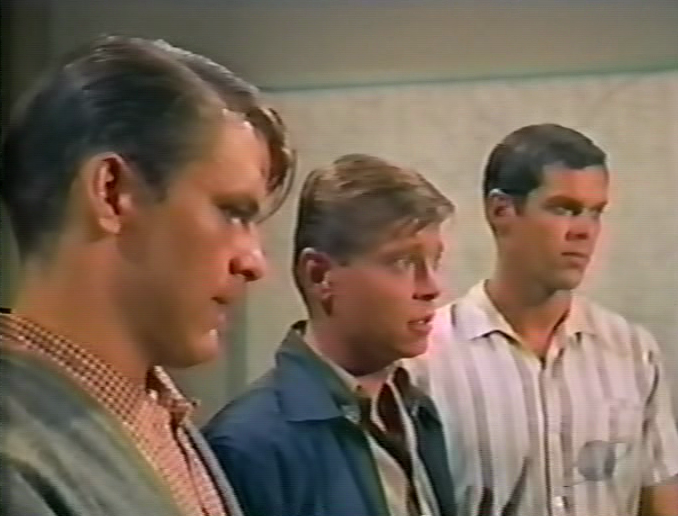 I don’t want to be in the background saying yes or no while these two guys do their thing.” He was very good about that, and then Cy Chermak, who really – after the first thirteen episodes, Rick Rosner was gone, and then there was Cy – they took care of me very well. You’ve said that you liked your scenes with Ponch and Jon, but not the expository scenes at the beginning of each episode. I didn’t like the expository stuff, because it’s hard. Everything they couldn’t show out on the highway, they’d have me tell at the podium. And it just goes on and on. It’s a challenge to memorize it. But, listen, they paid me well to do it, and here we are thirty-five years later talking about it, so I have little to complain about. Tell me what happened when Rick Rosner left and Cy Chermak came in. A somewhat more serious tone came to it. There was less of the comedy for comedy’s sake. But I think the big reason was, we were going over budget. I think this was the first dramatic TV series that Rick had produced. He’d produced game shows and talk shows before that, and he certainly was a good idea man. But Cy Chermak was an old hand; I remember him when I was at Universal. You had done some of his shows there – Convoy and The Virginian. He was a very good on-hand producer. We never went over budget after that. Never took more than seven days to do it, never ran over, which is quite a feat. In each episode we had a combination of three big events – either two chases and a crash, or two crashes and a chase, which takes a lot of time to do. Which means when you do get on camera and people are talking, you’ve gotta do a lot of pages. And we did. We had a great crew, who were very fast. And it’s to Cy’s credit that he did that. And Cy protected your character as much as Rosner had. He did, and I’d get maybe one or two storylines a year that were more about me. Actually, he’s the one who cast my wife, Gwynne [Gilford], as my pretend wife on CHiPs. There were only six episodes that she was in but when it came to casting her, I said, “I’d really like it if you’d cast Gwynne,” because she was a very accomplished actress at that point. She left the business when she was about thirty-five, but she had two series on the air that had short lives – one with Joe Namath, and then one with Eileen Brennan called A New Kind of Family. There’s an episode in the year 1980, where she was pregnant with our son Chris, and I said, “You know, you gotta write a storyline about this. This just begs for it.” And of course we’re getting up to the ninth month, and preparing to do this episode, and then there’s a strike and Gwynne has Chris, and we come back and do it later and she’s gotta use a pillow. 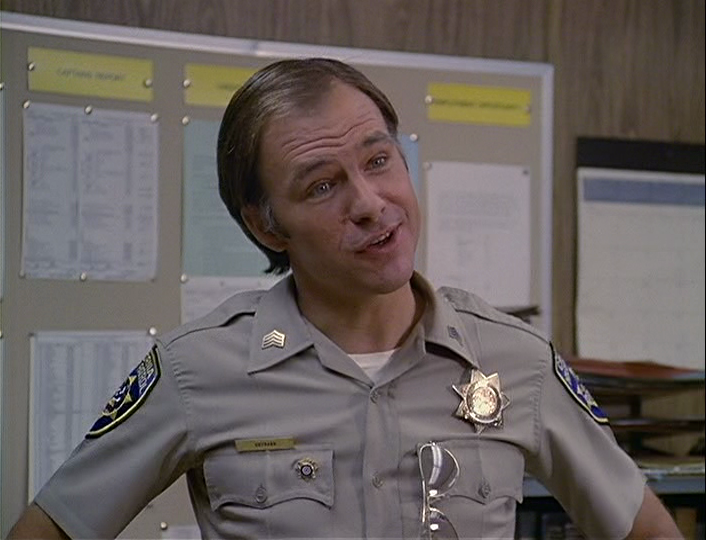 So Chris just missed making his television debut on CHiPs. Speaking of children: I have to ask about Erik Estrada and Larry Wilcox, who made headlines for their ongoing feud throughout the run of CHiPs. I observed some of it. I’m reluctant to really – this is a family. There arguments and stuff in families. That happens. There was some discontent, and it was a shame. But that’s the way it goes. I try not to take sides in it, because that doesn’t get you anywhere. On the whole, we had a wonderful cast, a wonderful crew, and it was fun going to work. Every show, while Cy was there, got done on time, that tells you right there that people came in and did their work. There were days when things got a little messy, but that’ll happen when two young guys are finding their way. They’re stars, and getting adjusted to that, and getting egos adjusted takes time. There’s a maturation period there. So would you say it got better as it went along? Uh … I don’t know about that. Which of the regular CHiPs directors do you remember? John Florea was a World War II photographer, and actually he helped me a great deal when I directed two episodes. He was a sweetheart. There was an Englishman, Gordon Hessler, who I also worked on Quinn Martin stuff with. He was a good guy, a little bit persnickety. Les Martinson, he was a piece of work; he was a funny guy, but also good. Phil Bondelli. All different guys but, you know, you only worked our show a number of times if we all liked you. The other ones didn’t last, for whatever reason. So all those guys who were mentioned a number of times were all fun guys. Occasionally your character got to leave the station and join Ponch and Jon on motorcycle patrol. About every three episodes they screwed up their courage and put me on a bike. Before the pilot, on a Sunday, they took us to the old MGM lot, which is now the Sony lot, and we practiced the bikes, going through the streets of the backlot. I remember going up one street where it came to a T, and you would go either right or left. On most bikes, if you let go, the throttle goes off, just as if you would press a pedal and take your foot off it. Well, on a police bike, if you were going 60 and took your hand off, it stayed at 60. You had to turn it down. So I’m coming to the wall there and had to make a choice, and I panicked and instead of deaccelerating I accelerated, right into the wall. My pride was hurt more than anything else, but people never forgot that. The only other time I had a thing was, I had to turn onto a dirt road, and the camera was way back and I thought I would goose it a little bit. I goosed it a little bit too hard, and it swerved in the back and it went down, going about thirty miles an hour. But I did a handstand on the handlebars, because I did not want my legs underneath that thing, and the only thing that got hurt was my pinky. They gave me a wide swath when I was coming near the camera. Do you have any favorite TV roles that we haven’t covered? Both comedies, of which you haven’t done that many. You’re a frustrated comedian at heart! Yeah, I am. Nobody sees me in comedy, and I always thought that that’s probably where I would make my bones. I mean, my dream job would be working at CBS Radford, which is very close to my house, and playing a deaf-mute, a lovable old guy so they can’t fire me, and never have to memorize any lines. And walk to work. That’d be great. I think I deserve it now. Along with many of the other principal cast members, Robert Pine will be a guest at the CHiPs 35th Anniversary Reunion, on September 15 in Los Angeles. Correction, 7/20/12: Mr. Pine pointed out, via e-mail, that each CHiPs episode was typically filmed in seven days. The original version of this piece gave the number as six days.